Greg shared his story Friday as part of the local Skypoint Ventures Flint Powers students and 100K Kids program. He explained to the students his role as CEO of ISource Worldwide, software development company, that created the cloud-based web-to-print service PrintSites, with the UPS Store’s 4,000 retail locations as PrintSites largest customer. Greg told students he worked hard to get where he is today and associated himself with people who had similar ambitions. “Write your goals down and track them often. Each day you must have a task list of daily goals” Greg told the group. Greg shared another wise advice with the young students saying “Humility will never harm you, Arrogance will NEVER serve you well”. It has come to our attention that there is a new eCommerce Web-to-Print, eCommerce company launching at GraphExpo this year called “Global PrintSites.” This is not us. Who We Are: PrintSites™ is a modern, Web-to-Print, eCommerce solution, proudly developed in Michigan by a team of passionate innovators. Since 2008, our mission has been to provide a comprehensive Web-to-Print solution that delivers a world class experience for both the storefront owners and the customers they do business with. What We Do: PrintSites™ Web-to-Print solution marries the world of traditional print with the ever-changing world of technology. By developing the most modern, feature rich, and low-cost solution, we feel that we are doing our part in helping small businesses across the country compete against the growing pressure from online giants. What We Offer: PrintSites™ Web-To-Print solution allows traditional print service providers, print brokers, and graphic designers to compete in the world of eCommerce. It’s the One-Stop-Shop – Your PrintSites storefront does it all! From Customer Portals to SEO to Source Management to shipping, manage your clients’ orders from beginning to end on one platform. Want to give PrintSites a spin? Here are five reasons why you should start today! 1. Personalized Service – We’ve all been there. You’ve had an issue with a product and now you have to call…Customer Support. You feel the headache coming on before you even start the three-hour phone call with the man with the heavy accent at the other end of the line, and that’s if you’re lucky that someone has picked up at all. With PrintSites, all that stress and worry is gone! Proudly located in Michigan, our Live Chat Customer Support team is always ready to help you. Both online and over the phone, our representatives are available Monday-Friday, 8 AM – 9 PM (EST). Their focus will be on the details with a commitment to accuracy, quality, and accountability to ensure the success of every endeavor. This passion and the relentless pursuit of customer success is why we have thousands of storefront customers that trust PrintSites with their online business. 2. Customer Portals – Have special VIP clients? Create a one-of-a-kind showroom for them that they can access 24/7. The streamlined ordering experience will allow you to offer special marketing collateral and pricing that this specific to each company and brand. A customer portal gives your customers direct access to their marketing collateral anytime, which gives them a greater sense of involvement, ownership, and brand control – solidifying your printing and business relationship. 3. SEO – Search Engine Optimization…three little words that mean so much to the success of your website and business! Each PrintSites storefront comes fully optimized right out of the gate, giving your website the chance it needs to be seen by potential customers as soon as you’re ready to go live. And let’s not forget about PrintSites SEOPlus. SEOPlus is our cost-effective marketing strategy that allows you to target people who are specifically looking for your products and services. Watch as you save money and gain site traffic and sales! 5. White Glove Service – Want to have your web-to-print storefront, but don’t want to spend the time giving it that personal touch? Just want to continue developing your awesome products? Don’t worry; we’ll handle everything! ✔ Products – What are you offering? ✔ Prices – Give us the base pricing and we’ll do the calculations! ✔ Logos & Imagery – We’ll brand the site to match your brick ‘n’ mortar company. ✔ Call Center – Yes, we offer one-on-one customer interaction with all of the guests on your storefront. Yesterday afternoon, we sat down with Corey Puklus, Vice President of Sales at PrintSites, to learn a bit more about what he does and his passion for providing the best in customer driven eCommerce. How long have you been the VP of Sales for PrintSites? And why did you join them? I have been at PrintSites almost from the very beginning. In June of 2009, I was brought on board to help launch sales. Originally, I was in the corporate banking world. I spent about 14 years working in Global Vendor Finance. It was a really big jump to move from Corporate America to what was, at the time, a small start-up company, but I wanted the challenge. I saw that PrintSites could be something great, and I wanted to be a part of it. I found it appealing to try to build something from the ground up. I love sales in general. I love working with people. Learning about our customers and their business goals is something that I enjoy. The challenges that they face and how our service could help them is important to me. I also love teaching our sales & support team about sales and how to sell our services. I take pride in seeing that direction and advice put into practice. What sets PrintSites apart from other eCommerce sites? That is a two-part response. First, we have a great platform. When I conduct demonstrations, I get great feedback from prospective customers.That positive feedback reinforces that belief. Even if it does not meet their specific needs at this time, they can see we are building something great. Secondly, it is our customer support team. Hands down! You have to have great support to go along with a great product, and they go above and beyond the call of duty every single time to ensure that our customers have a positive user experience. Because there is no term commitment with our service, we have to earn our customers’ business every single day. It shows too. Our customers have said that they appreciate the level of support that they receive here at PrintSites and that they haven’t found it anywhere else. You have to have great support to go along with a great product. What is the number 1 thing that you want potential PrintSites’ Store owners to know about PrintSites? We’re investing in our Storefront owners’ successes. Our support and development teams are listening to the requests of our customers, and they are doing everything that they can to deliver those features. We want to help our Storefront owners grow their businesses and we will do everything that we can to see that happen. Their success is our success! Is there a way potential customers can tour our PrintSites’ platform? Yes! I have group webinars on Tuesdays and Thursdays at 11 A.M. and 3 P.M. During these webinars, you will be able to see the “behind the scenes” of our platform and determine if it is the right fit for you and your company. If, however, those times do not work for you, please call our dedicated customer support team at:(888) 947.1301 to schedule a one-on-one webinar at a time that works best for you! It’s official we are moving!! 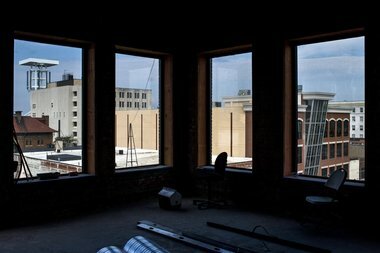 FLINT, MI – A software developer’s plans to bring 100 jobs to the newly renovated Dryden Building in downtown Flint are just the first steps in what some hope will be a bigger movement. “We’re trying to build a tech town here,” said Steven Knox, attorney for iSource Worldwide. Hourly wages for some of the jobs will be $20 an hour on the low end, Knox said, with developers, executives and other administrative positions earning $75,000 annual salary. The software development company created the cloud-based web-to-print service PrintSites, with the UPS Store’s 4,000 retail locations as PrintSites largest customer. The $2.65 million investment could bring up to 100 jobs, according to a statement from the Michigan Economic Development Corporation. The move downtown and plans for 100 jobs over the next two years will make iSource the fourth-largest employer downtown behind University of Michigan-Flint, FirstMerit and Rowe Professional Services, according to the Flint & Genesee Chamber of Commerce. Jobs at iSource will include those in the call center, technical support, sales support, inbound and outbound sales associates, developers, IT workers, a bookkeeper and a paralegal worker, Knox said. The entire third floor of the Dryden Building and part of the fourth floor will be used by iSource and the company will hire 25 people when it moves in by the end of the summer. There will be 19 employees who will make the move from iSource’s current location in Fenton, Knox said. The relationship between leaders at SkyPoint Ventures, which owns the Dryden Building, and iSource WorldWide has been forming over the year. The $2.65 million investment in collaboration with SkyPoint Ventures came after iSource received a $500,000 Michigan Business Development program grant and a $2.5 million loan for the project. Knox did not say how much SkyPoint has invested in the company. The Flint Journal could not reach Moe for comment on Thursday, April 28.